Hey, Urban Outfitters, I feel like it's been a while since we last caught up. What's new with you? Hybrid overall-tutus, you say? That's cool. What else — have you gotten into any new culturally insensitive exploits lately? Oh, you have? Of course. Classic Urb-Outf. Yes, it's true: Urban Outfitters, your favorite place to purchase wedge sneakers and inexpensive garments covered in triangles, is up to its old tricks. 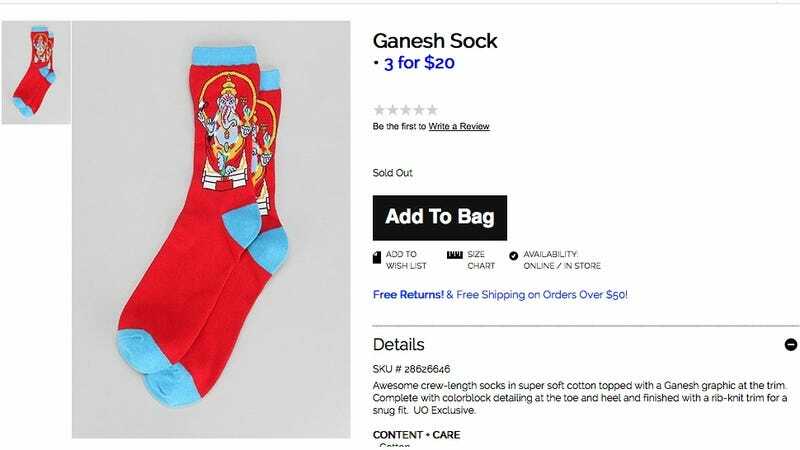 After public outcry, the retailer has apologized for selling a pair of $8 socks depicting the Hindu deity Ganesh, and they've since pulled the product. Earlier this week Hindu statesman Rajan Zed took to his website and wrote, "Lord Ganesh was highly revered in Hinduism and was meant to be worshipped in temples or home shrines and not to be wrapped around one's foot. Inappropriate usage of Hindu deities or concepts for commercial or other agenda was not okay, as it hurt the devotees." In Hindu culture, the feet are considered the lowest and most impure part of the body. It's seen as offensive to touch another person with your foot, and shoes are not permitted in religious spaces. According to Sanskrit.org, "The feet of people are considered low. In fact one of the greatest insults you can make is to throw shoes at someone... Feet touch the ground, which is low, and so when you enter a temple you leave your low part at the door. We take off our impure part, our feet, symbolized by leaving our shoes at the door as we enter sacred space." So, obviously, putting Ganesh on a sock, which goes between your foot and your shoe, is supremely ignorant and deeply insensitive. In an email to Hindu statesman Rajan Zed, who spearheaded the protest, Crystal Carroll, Public Relations Manager of Urban Outfitters, wrote: "We sincerely apologize if we offended the Hindu community and our customers. We appreciate Rajan Zed and the Universal Society of Hinduism for bringing this matter to our attention and for helping us understand the cultural and religious sensitivities this product carries. We will remove the Ganesh Socks immediately from our website and stores." While Zed is thankful for the apology and acknowledgement of fault, he's suggested that the corporation "send their senior executives for training in religious and cultural sensitivity" so that they can have a basic "understanding of the feelings of customers and communities when creating new products or launching advertising campaigns." Uh, yeah. I would say that's very overdue.